Watercolor is such a universally accessible medium, yet it’s not often thought of as a fine art form. Indeed, when novices and appreciators new to fine art think about acquiring desirable pieces, watercolor may not come to mind. The implements of watercolor painting are so common and familiar to everyone, memories of such emanating from childhood, it seems that almost anyone could and has used them. One might be prone to think their accessibility diminishes their impact. That is, until you experience this common medium executed with uncommon precision and grace. While painting with watercolors may be an activity familiar to preschoolers, it’s an unbelievably difficult medium to master. Watercolor paints have a propensity for wandering off into unintended areas of the paper. 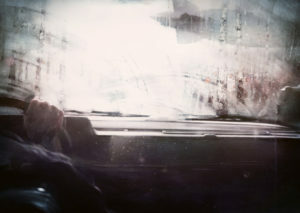 Mistakes are virtually impossible to hide due to the transparency of the colors. Every decision with the brush, every stroke, becomes a permanent part of the final work. Would it surprise you to learn that some of the oldest, rarest and most famous paintings are watercolor? Works that might be living a nebulous existence in the ether of our subconscious art biases include, The Blue Boat by Winslow Homer, Great Piece of Turf by Albrecht Dürer and In the Bighorn Mountains by Thomas Moran. These wonderful works are just a few diverse examples of the incredible range of the medium and the artists by whom it is employed. The rock stars of fine art history have been influencing contemporary watercolorists for centuries. When we look at the work from modern artists Phong Trinh, Turkish artist, Sukran Moral, and Russia’s Dima Rebus, we find echoes of their forbearers in deeply emotional and vibrantly detailed selections of contemporary watercolor. 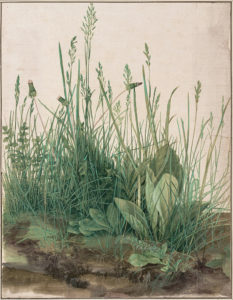 In the same way that the colors can run together, so can our perceptions of what the paintings are communicating — it’s one of the beautiful things about watercolor art: it seems to somehow be living. What does that mean? Living art allows the viewer to project her own feelings and perspectives into the artist’s world. Watercolor may do this better that some other mediums due to its intermingled, organic textures and soft-spoken manner. There is great excitement to be found in these fluidic explorations of emotion and thought. A prime example is Phong Trinh’s Rain A River Over Amboise, France. 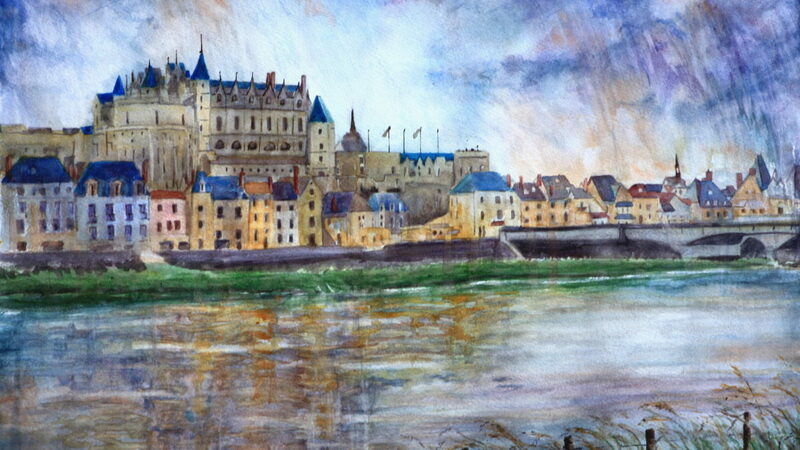 The painting transports you to the bank of the river Loire with an incredible view of the charming Château d’Amboise. It’s a view that simultaneously tells you about Trinh’s experience sitting by that river, but also that you too should board a plane and see it for yourself. 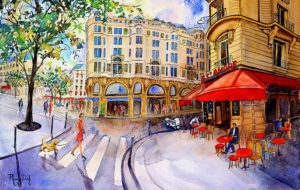 Watercolor is one of the oldest fine art mediums. 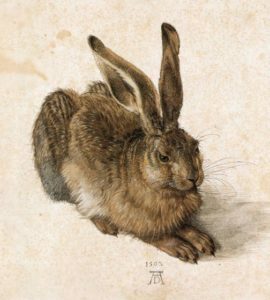 Albrecht Dürer’s master watercolor work, Young Hare is astounding in its detail and intricacy. The small creature seems wound and poised—ready to run at the slightest alarm. So expertly proportioned and perfectly executed is the subject, to think that it was painted in 1502 is mind-boggling. There is an important feeling of connectedness to the past when we see these masterpieces. That feeling grounds us in the reality that our time here is just a passing scene in a much longer play—the narrative of the human experience. Who knows which of these modern works will live on to tell something of our time to future generations? This is why collecting art is so important. We as curators and collectors, appreciators and aficionados get to help tell a story. A story of struggle and pain, joy and accomplishment. It’s a story we didn’t start and most likely won’t finish, but we have the chance to contribute to that narrative. Have you considered the impact adding a watercolor work to your collection might have when it is placed next to your other fantastic finds? 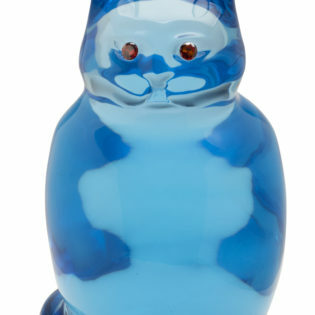 There is something to be said for a collection that touches the extreme edges of the collector’s stylistic leanings. We find ourselves attracted to these wonderful works when they tap into a deeper sense that the world is bigger than what we have seen. The feeling is both exhilarating and comforting. It’s these moments when we want to find a little boat and sail into an ocean of color and water. 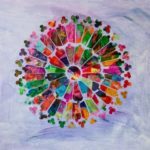 If we were to follow that impulse we would discover that while watercolor paints may be watered down, their resulting expressions retain a full-blown vividness. *Ed note: The original piece, Nubus, was painted in 2015. In 2016, it was shown again, but this time as part of performance art. The painting was photographed being set on fire and destroyed by another artist. That photography was entitled Goodbye Nubus. So much for sentimentality in art.